It was two years ago this week that I got this shot in Rock Creek Canyon in the Eastern Sierra. It's on my dining room wall these days. Click above to see larger. The photo is a testament to good timing. It had snowed a bit the previous night. The photo was taken about 3:20 p.m. -- a little less than three hours before sunset. This is the view south, meaning the sun was directly to my right. And there were a lot of clouds floating through, lending to the drama. I took this with my Nikon D5000 (since replaced with the D5100) before I was shooting RAW; I'm still not sure I got the processing quite right but who cares? The photo works and this is basically the same scene that was in front of me -- fall meets winter kind of thing. If you've never hiked in Rock Creek, you gotta go. 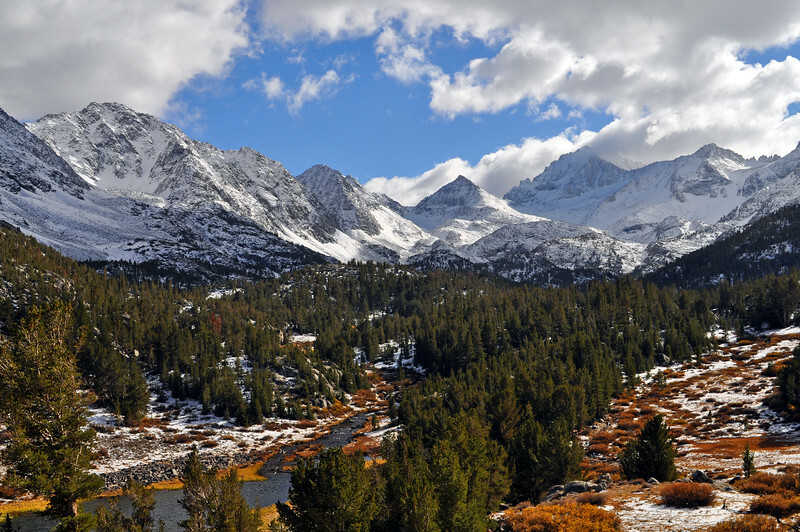 It's one of the more dramatic and accessible spots in the Eastern Sierra with many lakes surrounded by many tall peaks. From Bishop, drive north on U.S. 395 for about 23 miles. At Tom's Place, turn left on Rock Creek Road and drive 8.6 miles to the parking lot at the end of the road, the Mosquito Flat Trailhead. The trail begins by the restrooms -- go about .5 miles and when you crest the hill, that's the spot where this was taken.